And In Other Important Tax News ….. Many people dread the day they have to sell their business – root canal treatment is a more preferable option. It doesn’t need to be like that – some thought and planning can turn it into a rewarding exercise. A business is probably the most important investment an entrepreneur will make. It is crucial with any significant financial undertaking that the investor have an exit strategy. Without this, there is a risk that the full value of the investment will not be realised, particularly in the fast moving world we are now in. For example, technology can quickly make a business redundant and one should have pre-determined “triggers” to indicate when an investment risks losing value, making it a good time to sell. To whom do you want to sell? A family member or the staff in the business or will you go to the market and see what it will pay? This is an important consideration. Next, plan backwards – what will a purchaser want to see? At least two years’ financial statements which should show good and increasing profits. If the financial statements are not audited, consider doing this. An audit will give a purchaser that extra assurance that the financials are independently and fairly stated. A succession plan. This will give a purchaser comfort that the business can be managed without the owner. It will also indicate that the staff has some form of assurance their livelihoods are being looked after. If the staff are happy, they will be productive. A good business owner will want to leave a legacy, so ensure the organisation will be well run after you have left. Complete staff records – years of service, salaries, promotions, disciplinary issues and so on. Well documented systems and procedures. This indicates to a prospective purchaser the business is well managed and well run. It will also be of value to them when they take over the business. All other pertinent information such as leases, major contracts, any disputes or pending legal matters etc. Records confirming that all compliance measures are in place including that the business has tax clearance and all laws are complied with. Minutes of meetings, especially board meetings, will need to be comprehensive with all legal requirements fulfilled e.g. notice periods for meetings. Your customer list. It’s good to review it well in advance, so if there are any gaps, new customers or new segments can be found. A list of business assets. Putting together a due diligence is very time consuming but doing it over a period of time will make it more comprehensive and it will be easier to compile. It gives you time to ensure that the business will look attractive to a purchaser. Have the business valued by an independent valuer. Doing this well in advance of selling is also beneficial as it will indicate any shortfalls in your business which you can rectify before going to the market. Selling a business will be a lot easier with good planning and preparation. Talk to your accountant who is in a good position to give you sound advice. When the lease on an apartment or house comes to an end, many tenants give up part or all of their deposits so the landlord can make good damage supposedly done by them. Even more tenants lose out on interest accrued on their deposits. With residential property the law can be used to even up any such imbalances in favour of the landlord. Note that your rights in this regard are set to be strengthened when amendments to the Rental Housing Act come into effect (probably later this year). In terms of the law, your landlord is required to meet with you prior to the lease commencing and draw up a list of defects or damage. This list is to be an annexure to the lease so make sure that anything problematical is recorded and can’t later be blamed on you. Similarly, at the end of the lease, you and the landlord again inspect the premises to establish any damage caused during your occupation, as well as any other costs incurred by the landlord such as lost keys etc. Should the landlord not attend either of these inspections, he forfeits the right to use the deposit plus interest on it to undertake repairs to the premises. The landlord is then required to return the full deposit and interest (if there is any) to you within seven days. In addition, the landlord must show you receipts for any repairs undertaken if you request them (you should). Insisting on these steps, plus taking care of the property, will protect you and help ensure your deposit is refunded. When you deal directly with the landlord then the deposit must be invested in an interest bearing account with a bank. The interest rate cannot be less than the rate earned on a savings account. On completion of the lease, the interest earned is refunded to you along with the deposit. This is governed by separate legislation and the terms of the lease are important. If the lease is silent on the interest, then the estate agent is obliged to pay this over to the Estate Agents’ Fidelity Fund. In practice, the agent gets 50% of this back from the Fund. So always negotiate for the lease to reflect that the deposit must be paid into an interest bearing account and that the interest accrued is to be paid to you at the end of the lease. This negotiation is subject to market conditions – for example, tenants renting property in high demand areas like Cape Town's Atlantic seaboard will not be in a strong bargaining position. But, if you are a commercial tenant ….. The above applies to residential property. In commercial property leases, there is no law compelling landlords to invest a deposit in an interest bearing account for the benefit of the tenant. However where you are dealing with an estate agent the situation is the same as with residential property. Again, make sure the lease itself specifies that you will be paid interest on your deposit. It is often said that the greatest problem facing the country is youth unemployment which is over 50%. How can we manage this? Outsourcing is one potential answer that can create jobs for our unemployed youth. In India 2.8 million jobs have come from outsourcing. These jobs are typically Call Centre related or involve processing work such as simple accounting. The Department of Trade and Industry has since 2011 provided incentives which target outsourcing. Up to 2014 over 9,000 jobs had been created. There is no reason to doubt that once we acquire a reputation for outsourcing, it will accelerate into a substantial job creator. One view is that there is the potential to create over 190,000 jobs in the short term. With 160,000 graduates coming into the market each year and another 250,000 already looking for work, there is a sufficient pool of potential job seekers who are literate and speak good English. Small business - take advantage of this in 2016! Setting up an outsourcing business is not that complicated. Entrepreneurs who want to earn foreign currency should seriously consider this. Don’t kick yourself however if you rushed to beat the deadline - you will almost certainly still have to comply somewhere down the line, and at least you crossed off one annoying little red tape item from your To-Do list. Procrastinators on the other hand are doomed to repeat the eleventh-hour panic in 2020. Rather comply now if you haven’t already done so. Does this extension apply to you? 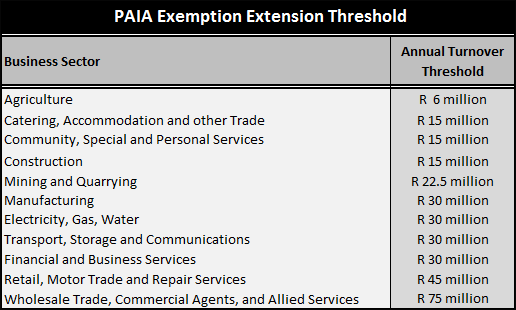 An annual turnover of or above specific thresholds – see the table below for details. c. Via Electronic Funds Transfer (EFT). Remember that banks will not process payments that are not correctly referenced. This means you need to include your Tax number and the payment reference number. Please also note no cheques will be accepted at SARS’s offices either via post or dropped off. The payment desks at SARS will be discontinued. Secondly, coming next month – “How you can use eFiling to resolve disputes with SARS”.